1. If the total chess players in city Z are 240. Then total no. 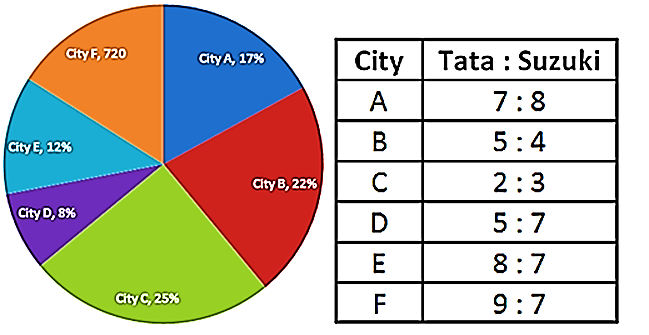 of players in city Z is what percent more/less than total players in city K?(approx.) [Given that ratio of cricket to chess player in city Z is 7 : 8]. 2. If the difference of cricket and chess players in city X is 321 and the Hockey player in same city is 40% of the total chess and cricket players in city Y. Then find the difference of average players of city K and L together and player in city X? 4. If total players in city X is 1300 and total Hockey players are equal to the total of cricket and chess players in city X and also ratio of girls to boys Hockey player in city X is 5 : 8. If 40% of girls are transferred to city L, then find total player in city L? 5. Suppose there is another city named A in which Hockey players are 60% of the Hockey player of city Y and cricket plyers are 66 2/3% of the Hockey player of city K and chess players are 2/5 th of total player of city L. Then find total players in city A? [Given that hockey players in city K is equal to total cricket and chess player in same city]. Directions (6 – 10): Study the following pie chart and table carefully and answer the questions given below. Table shows the ratio of no. of cars sold of company Tata and Company Suzuki sold in different cities. 6. 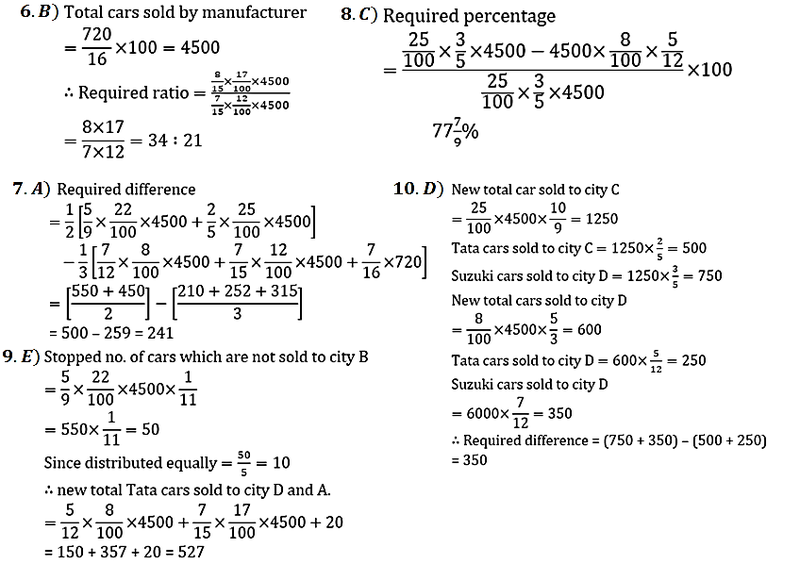 What is the ratio of cars sold of company Suzuki to city A to the cars sold of same company in city E? 7. 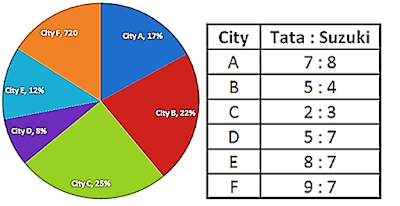 What is the difference of average of cars sold of company Tata in city B and C together and average of Cars Sold of Company Suzuki in city D, F and E together? 8. The number of cars sold of company Tata in city D is what percent more/less than the number of cars sold of company Suzuki in city C? [Rounded off to two decimal places]. 9. If the manufacture stopped 9 1/11% of the supply of company Tata in city B and distributed the stopped supply of city B among the other five cities in equal number. 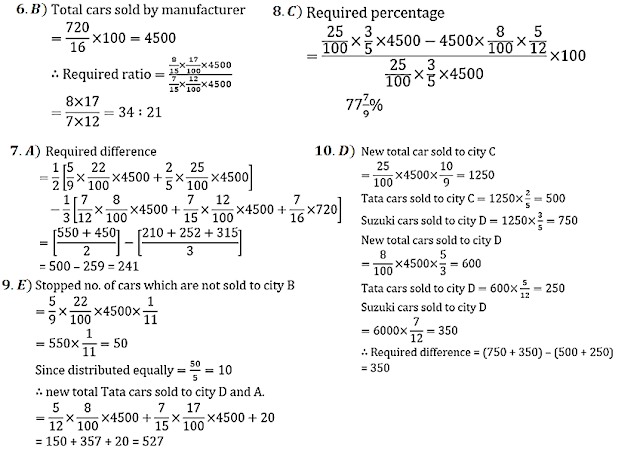 Then find the new total Tata cars sold in city D and City A together? The following line graph shows the total no. of students who are preparing for three different exam viz. SSC, Bank and Railway who participated in a seminar organized by an institute in five different years. The table shows the ratio of male to female who participated in seminar. 11. The total no. of male students in 2014 from all exam who are participating in seminar is approximately what percent of total no. of female students from all exam who are participating in seminar in 2013? 13. What is the average no. of male students preparing for Railway exam who participated in seminar throughout all the five years ? 14. Total no. of male students preparing for Bank exam in 2016 and 2017 together is approximately what percent more than the total no. of female students preparing for SSC exam who participated in the seminar together in the same years? 15. In 2012 the career power had organized the seminar in which the total no. of student participating in seminar who are preparing for bank, SSC and Railway exam was 10%, 20% and 25% less than that in 2013 respectively and total no. of boys who participated in the seminar in year 2012 preparing for Bank, SSC and railway exam were 1000, 1500 and 2000 less than that in 2013 respectively. Find the total no. of girls participated in seminar in 2012 preparing for Bank, SSC and Railway exam together?